A 4.5 minute video demonstration of how CSC CloudCompute works and the value it delivers to customers. A 3 minute movie describing the capabilities of CSC Cloud IU for SAP. Responding to the needs of the mobile workforce and the cost of application maintenance and management, businesses are moving their email and collaboration applications to the cloud. Our webcast with VMware will help you discover the five key questions CIOs should ask when selecting the best mail solution. A video describing how BizCloud helps clients balance risk and agility with a fully dedicated private cloud. In June, BizCloud's Sunil Bhargava, Pamela Casale, Rick Valencia and Gabe Kazarian received CSC's Chairman's Award for Excellence. This on-demand webinar describes the benefits of modernizing SAP infrastructure with the cloud! Featuring Sunil Bhargava-- Global Cloud Portfolio Executive from CSC, Mark Thorp-- Alliance Director from SAP, and Andy Sitison-- Director/Global Lead, Application Sales Programs from EMC. Sunil Bhargava, Global Portfolio Executive for CSC's Trusted Cloud and Hosting discusses how organizations finding success with cloud computing take a business first approach in choosing which applications to migrate and determine the right cloud model based on the application, risk tolerance and compliance profile. This impact movie gives insight into CSC's fastest and most economical path to the cloud. A 4.5 minute demonstration of CSC CloudMail for VMware Zimbra--a fully managed mail solution delivered as a service--available anytime, anywhere. 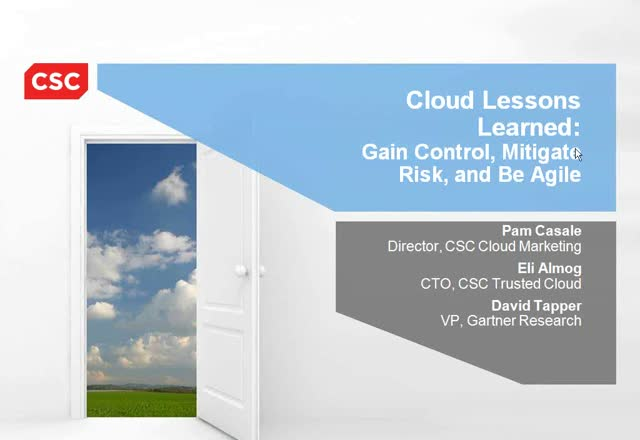 A minute and a half long video on CSC's capabilities and offerings in the cloud. As leaders in Cloud Computing, we share our perspectives, innovations, services and lessons learned in webcasts and videos.